Remember how local Internet Service Provider, Powertel, made the biggest pricing mistake in telecoms last year when it scrapped its superstar unlimited package and opted to introduce a usage-based system instead. Well, the ISP seems to be fighting for customers’ attention with its new unlimited package. Before you get excited, there’s a bit of a caveat to this new unlimited package which has been dubbed the Weekly Fiesta Mobile Broadband Promo. First, it’s not as spectacular as the old unlimited package. It only allows you unlimited browsing during off-peak hours (8pm to 6am), like the off-peak unlimited browsing option introduced by uMax last year. 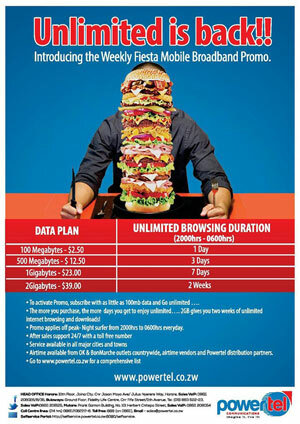 There is also a set number of days you get this unlimited window, based on which data plan you choose. The table below gives a breakdown. According to Powertel, downloads will be enabled for the unlimited browsing window, and even if you burn through your actual data during peak periods you will still have access to the unlimited browsing window. Apparently Powertel is trying to increase its value proposition to its subscriber base that felt cheated when it killed its unlimited offering that, for a while, stood out as the most cost efficient access to unlimited internet. While it’s too late to say whether this is going to be huge hit with Powertel subscribers that stayed on or if it will be enough to lure back the ones that deflected to other ISPs, it does seem like a step in the right direction. However, with services like ZOL Fibroniks coming in at $39, the market is changing rapidly and Powertel has to really ramp up its value offering. It still has to compete on aspects like the amount of data offered, coverage and the speeds, so solving the price puzzle is just one aspect to consider. Too late! I m nt falling for tht bait and switch. I appreciate the effort. They are responding to real market pressures brought about by competition but at about $80/month, they are still lacking. Peak hours are ‘peak’ for a reason and 4gb won’t cut it for a lot of people. It feels more like a loyalty program reward than an all out move to recapture market share. How reliable and how fast is their service? How well does the service function during peak hours? The measured criteria discussed in the article says nothing about that. Value to me is measured by far more criteria than price per byte. Thats a typo, right? Otherwise do tell us where this elsewhere is…. I can say for certain, for R250, on MTN, you can get 4Gb (with a bonus double). Meaning 8GB. Peak or off-peak. Here in Malaysia Im paying $1 for 150GB for 1day or $3 for 300Gig for 7 days and for $35 i get Unlimited fibre access. Zimbabwe is way too expensive i was there in January I was disappointed. Even the ADSL is pure rubbish! Here in Namibia we get 1.1GB for 35rands, these companies in Zim dont know economies of scale thats why they fail. They operate like hit and run companies who make a quick buck and close shop. there is no way i’d return to powertel. even now, their fibre option is a 300 metres away from y house but they asked me for $4000. They have no idea what their customers are an why they should treat the well. I was with their dongle package since it started with spotty access and lots of downtime. It’s not that we felt cheated, they did cheat us and have no loyalty to the customers who were loyal to them. after paying for my last unlimited bundle(last year). i told the sales guy it wasn’t going to work and the arrogant sales guy said “Hapana zvakadaro, munoenda kupi”..
Powertel has poor connectivity, is often not avaible and bloody expensive.Unless you want to obviously want a headache going around the whole house with a dongle then try it. powertel kwakuseri, i can leave my torrents running manheru for free!!!!! We still have a long way to go here in Zimbabwe. The speeds need to be consistent right across the country, how can a company advertise upgrade of speeds which actually are area specific. So more work needs to be done. Africom Michoice and Super data promotion are waaay cheaper!